Tipping the scales at less than 800 grams (790g for a size small frame), the Gallium Pro is in exclusive company with the lightest pro-level road bikes in the world. But that’s just the start of what makes this bike special. 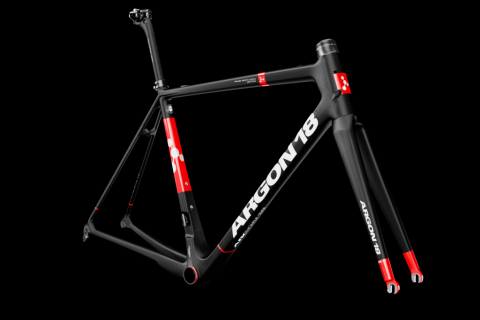 For the past 26 years, Argon 18-a brand that was started by former Canadian pro Gervais Rioux in Montreal-has been constantly developing and refining its road racing technologies. And this year’s Gallium Pro represents everything the company gas been striving for over the years. It’s made with the highest quality 7050 HM carbon composite to give it an impressive stiffness-to-weight ratio, and it boasts a number of unique technologies aimed at improving its ride quality. Starting this year, the Gallium Pro is the bike of choice for the climbers and GC specialists of the BORA-Argon 18 German pro continental team. The riders appreciate the frame’s feathery weight, but Argon 18 says rigidity and comfort were given equal attention during the bike’s development process. That balance of stiffness and comfort is based largely on a concept called Horizontal Dual System (HDS). Imagine a diagonal line running from the head tube down to the rear dropouts. Everything below the line represents the “Power Zone,” where rigidity matters most. With the Gallium Pro, that means an oversized head tube up front to ensure crisp, precise handling while cornering or sprinting, plus a massive bottom bracket area and asymmetrical chainstays to maximize every bit of energy you put into the pedals. One of the most critical aspects of comfort is having a precise fit. New for 2015, the Gallium Pro features an updated version of its 3D head tube system. This technology allows you to structurally adjust the head tube height so you can raise or lower the handlebar position without relying on traditional spacers. According to Argon 18 test results, raising the bar 15mm lets you retain 5 percent more rigidity compared to standard setups, and raising it 25mm saves 11 percent. The geometry of this frame is made for racing, but it also features a few small tweaks to smooth out the ride. Most notably, the bottom bracket has a 75mm drop, which helps lower the center of gravity to increase stability.